We are continually amazed and frustrated by the tendency of farmers, even large and successful farmers, to sign contracts without reading them or trying to negotiate unfair provisions of the contracts. Few business people, in other industries, are willing to accept the risks and liabilities which result from such an attitude. As a result of this tendency, businesses which deal with farmers know they can draft contracts which are extremely onerous on the farmers and the farmers are unlikely to object. Further, because few farmers read contracts and negotiate the provisions of contracts, the businesses which deal with farmers can refuse to negotiate with those few farmers knowing they stand to lose little business. This helps perpetuate the common belief amongst farmers that there is no point in reading contracts and trying to negotiate contracts because the other businesses (the “counterparties”) will not negotiate the terms. In other industries most businesses, even very large businesses, negotiate the terms of their contracts because many counterparties will not deal with them if they don’t. If enough farmers object to unreasonable terms in contracts and refuse to sign contracts containing unreasonable terms, the businesses they deal with would soon learn to negotiate (or to draft reasonable contracts). Of course, most farmers get away with not reading contracts most of the time because counterparties rarely use the unreasonable provisions. Using them will give the counterparty a bad reputation and be bad for their business. That principle holds until the counterparty starts to struggle financially. In those circumstances, the counterparty will often use all the contractual rights available to them to survive, irrespective of what it does to their reputation. Further, liquidators of companies are obliged by law to maximise payments to creditors and must use all assets of the company in liquidation, including all contractual rights, to achieve that end. So when reading contracts, what should you look for? (iii) The price quoted to the customer. As “the supplier’s current ruling price at the date of delivery” is not defined in the contract, this provision means that the supplier can charge whatever it likes for the product. If you select and purchase a product based on a quoted price, you cannot hold the supplier to that price. If the supplier sends you an invoice and you pay it, the supplier is entitled to send you another invoice and charge you more for the product. if any of the goods are used or mixed with other materials, record the value of the goods so consumed in relation to each unit of finished product and upon sale of any unit of finished product, immediately remit that amount from the proceeds of sale to the supplier. Provisions such as this are designed for the supply of products to manufacturers, but they are often included in contracts used by suppliers of products to farmers. No farmer is likely to comply with the provision, so farmers will breach the contract whenever they purchase a product, allowing the supplier to use the default provisions of the contract to the detriment of the farmer. (c) Charging Clause – The customer charges all of its right, title and interest in any land and personal property held now or in the future by the customer to secure the payment of all amounts due and payable under the contract. The customer consents to the supplier lodging a caveat or caveats to note the supplier’s interest under this clause. Upon demand by the supplier, the customer agrees to immediately execute a mortgage and/or other instrument of security in terms satisfactory to the supplier to further secure the amounts due and payable under the contract. This is a very onerous provision which could result in the farmer being restricted from selling agricultural products, plant and equipment and land. It entitles the supplier to considerable power over how the farmer runs his or her business. As most farmers have an assets base far in excess of the credit likely to be provided by the supplier, a provision such as this is rarely necessary to protect the supplier’s legitimate interests. (e) a term that permits, or has the effect of permitting, one party to unilaterally determine whether the contract has been breached or to interpret its meaning. A contract is likely to be a standard form contract if one of the parties has all or most of the bargaining power and if the contract was prepared by one party without discussion with the other party and the other party was given no effective opportunity to negotiate the terms of the contract. The Commonwealth Parliament has recently passed legislation which extends the unfair terms protections to small businesses. Under the legislation, the protections would apply if at least one party to the contract employs less than 20 people and where the price payable under the contract is less than $100,000.00 (or if the contract has a duration of greater than 12 months, where the price payable is less than $250,000.00). This will include most contracts entered into by most farmers. The main changes will take effect 12 months after the legislation receives royal assent. The changes will apply to all contracts entered into or renewed after the legislation takes effect (but not to contracts existing at the time the legislation receives royal assent). We are not suggesting that when the protection against unfair terms applies to small businesses, there will be no need to read contracts. On the contrary, we are suggesting that the introduction of the new protections will presents farmers with an opportunity to substantially reduce risk to their business if they are willing to start reading and negotiating contracts. Over the next few years, many businesses which deal with small businesses will be reviewing their contracts with a view to eliminating unfair terms. 2. 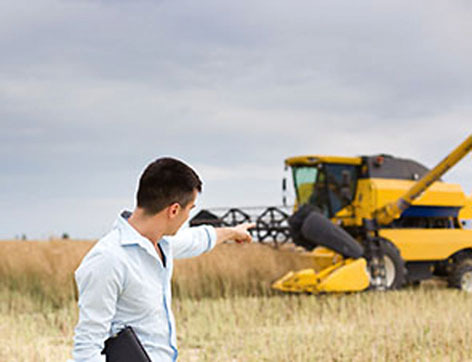 If the supplier refuses to amend or delete the provision and the farmer proceeds to sign the new terms and conditions, in the event of any future dispute the farmer will have a strong argument that the contract is a standard form contract and subject to the unfair terms protections. If any farmer has a supplier which does not forward them proposed new terms and conditions of trade after the introduction of the new unfair terms protections for small business, we suggest that the farmer request a copy of that supplier’s terms and conditions of trade, attempt to negotiate them and sign the negotiated contract (even if it is unchanged). This should have the effect of renewing the contract and bringing the contract under the unfair terms protections. Disclaimer: The information is of a general nature only and is not intended to be a substitute for legal advice. It is recommended that these matters be discussed with a lawyer. Article provided by Oldham Naidoo Lawyers.